Because of cyclical lunar dating, the first day of the year can fall anywhere between late January and the middle of February. On the Western calendar, the start of Chinese New Year this year falls on Tuesday, February 5, 2019  The Year of the Pig. 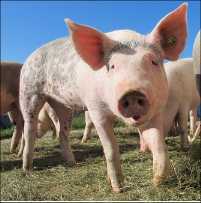 If you were born in 1935, 1947, 1959, 1971, 1983, 1995, 2007, and 2019, you were born under the sign of the pig. The Pig can be very naive, however, and may easily fall victim to the unscrupulous who take advantage of their idealistic nature - as Pigs see everyone as loyal and caring, and hold fast to the notion that everyone is at heart decent and admirable as they are! Famous people and historic figures born under the Sign of the Pig include Lucille Ball, Humphrey Bogart, Thomas Jefferson, Ernest Hemingway, Alfred Hitchcock, Mahalia Jackson, David Letterman, and Arnold Schwarzenegger. In Chinese culture, the new year is a time to begin again. It's little wonder why Chinese New Year is also known as the Spring festival with hope for better times ahead. Families are outfitted in new clothes, front doors are freshly painted, homes are scrubbed sparkling clean, and banners are hung to declare a very Happy New Year to all! Of course, food -- and lots of it -- is the centerpiece of any Chinese New Year celebration, and entire books could be written on various Chinese New Year food traditions that have originated over the centuries. As an example, carp is a main dish because the fish represents strength and endurance. For desert, oranges and tangerines are often featured since their Chinese names sound like "gold" and "wealth". The colors of the new year are red and gold, signs of good luck and prosperity. During family get-togethers, gifts are exchanged and red envelopes are filled with "lucky" money for children. Like Christmas lights that help to dispel the dark days of winter, the traditional Chinese lantern festival also plays a prominent part within the new year tradition. Strewn through neighborhood streets and marketplaces. these bright symbols of hope mark the return of better days as winter finally retreats -- and spring moves forward! And what would the celebration be without dancing dragons and fireworks to bring luck througout the year? 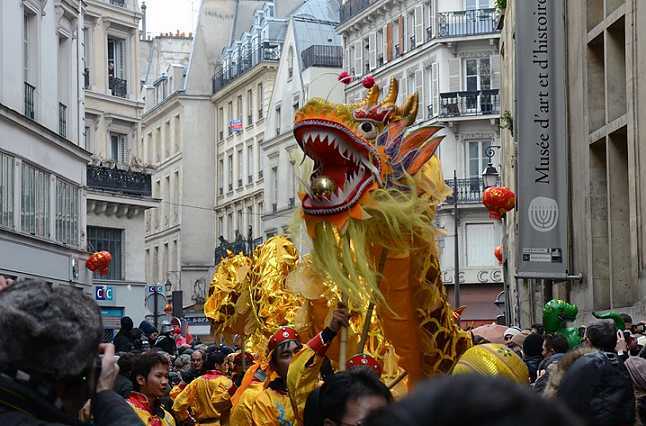 A dragon weaves through the streets of Paris during a Chinese New Year celebration. The longer the dragon, the better chance for good luck throughout the year. One of the most auspicious signs in the Chinese zodiac, the dragon is a traditional symbol of good luck and prosperity among the Chinese. During the New Year, the beast is sure to make an appearance doing its snake-like dance via a team of street dancers -- who manipulate a long flexible dragon figure using poles positioned along its length. The longer the dragon, the more luck it will bring! Some dragons may stretch a 100 feet or more in length. During the grand spectacle, firecrackers usually go off with a loud bang in order to ward off any chance of evil spirits getting in the way of all the fun! Chinese New Year - Wikipedia - Check out a wonderful overview of the history, symbols, customs & foods surrounding the 15-day festivities including information on traditional gifts, flowers, fireworks, good luck / bad luck superstitions, how Chinese New Year is celebrated around the world, plus lots of related links and resources. Teacher Planet - Chinese New Year - This is a great collection of fun activities and instructional how to's including dragon crafts, paper lanterns & garlands, scavenger hunt sheets, related lesson plans, plus links to clip art & history resources. Chinese New Year Greetings, E-Cards - A collection of animated and Flash greetings, Spring Festival, and Happy New Year cards. Chinese New Year Clip Art - Check out kid-friendly images of zodiac signs, dragon parades and more. The traditional New Year dinner for the imperial house was composed of 99 dishes since the number 9 is an auspicious number! Fish are a good luck food, but take care to serve the fish whole to preserve the good fortune.